(One Week Summer Guitar Evaluation and Setup Seminar) Cost $700.00 all inclusive. 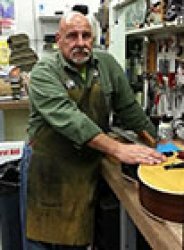 Instructor: Eric Sisterhen, Senior Instructor at Eastern School of Fretted Instrument Repair. This offering sponsored by the Raritan Bay Guitar Repair allows those guitar and bass players who have always wanted to better understand and service their own instruments the basic knowledge and skill sets that will allow them to do so. Over 5 days you will learn how to evaluate both acoustic and electric guitars and basses. You will learn to recognize common issues affecting these instruments and simple but effective adjustments that will make your guitar/bass play that much better. Attendees will learn how to measure relief and string height and will learn how to work to spec as part of the set up process. Attendees will also learn some simple tricks to enhance the playability of their instruments. Attendees will receive as part of their tuition a series of handouts, a personal tech tool kit and a 6 inch ruler that will be theirs to keep. Kyle tries his hardest to make every piece that walks in the door the very best it can be, whether it’s a 100 or 5000 dollar axe. We take our time with each one. Listening to you the player to ensure you have the very best experience with your axe when we are done. Summer 2019 dates coming soon – Please check back!